What Do I Do if my Pool Pump Stopped Running? Is your breaker turned on in the basement? Is the valve open on the front of your pump? Is your filter handle position turned to filter? Your pump became noisy and loud before it stopped working. Your pump strainer basket has air in it. Your pump ran for extended periods of time without water. Your pump does not start as quickly as it used to. How Much Do Pool Pumps Cost? In general, pumps range between $650 for a small, single speed pump to $1,300 or more for a high-end, variable speed pump installation. What is the Purpose of a Pool Pump? There is an old adage related to children, as well as pool pumps: they should be seen, and not heard! The pump moves water through the system. After it’s moved through the system, the water is pulled through the skimmer. The water is then pushed through the pump’s filter, ensuring that your water supply is nice and clean. A pool pump should run efficiently, and quietly. If your pump is noisy, replacement may be imminent. Replacing your pool pump with a modern, quieter model will save you money on operating costs, extend the lifespan of your pool, and keep your neighbours from complaining. Pool pumps should last over 5 years, with many models lasting as long as 10. Installing a pump that is properly sized to your pool is the most important variable in increasing the longevity of your pool pump. As a general rule for Winnipeg in-ground pools, a pool pump should not be larger than ¾ hp. Any larger, and it will be over-worked, will burn out quickly, and increase electricity costs when in use. What Types of Pool Pumps are Available? Single Speed Pump: This type of pump are the most commonly found pumps in most older in-ground pools in Winnipeg. Thanks to advances in electric motors, these pumps are now available in a quieter, more efficient design. Variable Speed Pump: These pumps are a modern style of pump, and are 4 times more energy efficient than single speed pumps. Variable speed pumps are quiet and efficient, saving users up to $1.50 per day in electrical costs. With the increasing costs of electricity, investing in a variable speed pump may pay off in as soon as 2 swimming seasons, as they use about 80% less energy than single speed pumps. To learn our supply and installation prices, as well as assistance in choosing the style of pump that will work best for your needs and lifestyle, give UV Pools in Winnipeg a call today! How much power does my pool pump burn? How much does it cost to run? Depending on the size of your pool pump, it will burn between 1,000 and 1,600 watts per day. This equates to $1.50-$2.50 per day in Winnipeg if ran 24/7, with our current hydro utility rate. Our recommendation is to use the smallest pump possible for your pool, or to invest in a variable speed pump. These pumps only cost about $0.25-$0.50 per day to run. Why is my pool pump making noises? When your pool pump is making loud noises, the seals are most likely shot, or the motor bearings are rusted and pitted. Replace the bearing and seals if possible, but it is usually better to buy a new pool pump if your existing pump is an older model. Should I get a bigger pool pump? This is a common question, and it has a common answer. 95% of the time, the answer is no. New pool pumps are more efficient, and have better designs, allowing more water to flow per horsepower than older pumps. Providing that your pump was originally sized properly, replacing with the same amount of horse power is usually sufficient. When a larger pool pump is installed with the same piping and filter used, the pressure in the pump will increase, along with the electrical bill. The filter is put into overdrive, but does not clean any better or faster. For the same price as a larger pump, you can purchase the same size pump as your existing pump. The motor on my pool pump buzzes and hums when it is turned on. What does this mean? Most often, a pool pump will buzz or hum from sitting still over winter, or if the motor capacitor is failing. 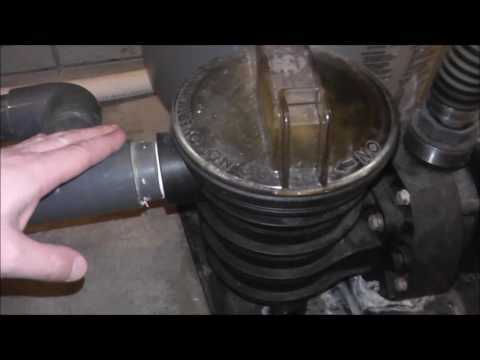 Usually, pool pumps contain a cap on the end of the motor that can be popped off, allowing users to manually rotate the motor while the power is off to free up stuck facets from the winter. When the motor takes longer to start and makes continuous buzzing noises, the capacitor probably needs replacing. If your pump is new, ensure that the correct voltage is being applied to the motor. The voltage will be either 120v or 240v, and the wiring diagram will be displayed on the motor. Possible causes of air bubbles in pool pump or in the pool. 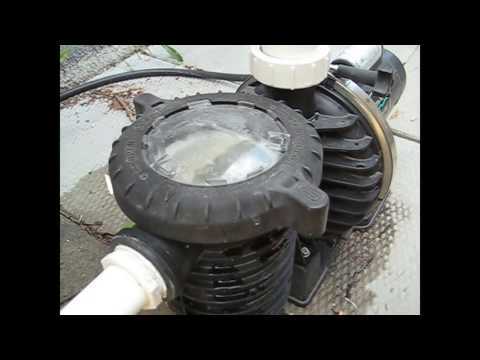 This is an explanation on how to winterize your pool pump. 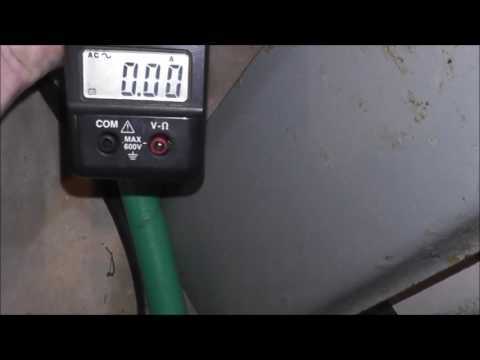 This is an explanation on how to calculate how much power your pool pump is using.